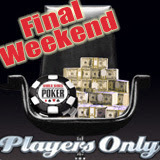 It’s almost time for the WSOP Main Event, which means PlayersOnly.com’s $150 WSOP Giveaways campaign is coming to a close. The last of PO’s twelve satellite tournaments will be this Sunday night, and Sunday is also the last day to place bids in their unique Low Bid Auction. Bidding has been steady in the unique low bid auction of a WSOP Player Package and is expected to be heavy in the final weekend. While they obviously can’t be specific, the site says the winner is quite certainly going to get a very sweet deal. "Of course I can’t divulge which bid amounts still don’t have unique bids on them yet, or which bids already have multiple bids," said PlayersOnly.com Manager, David Anderson. "All I can say is this $12,000 prize package could easily go for peanuts!" Bids can be placed until midnight Sunday either online at www.playersonly.com/bidWSOP or by cell phone text. (Full phone bid instructions also at www.playersonly.com/bidWSOP.) Any registered player can place bids and players can place as many bids as they want. Registration is free, however PlayersOnly.com accepts registrations from U.S. residents only. There is a charge of US$1.99 per bid – but the first bid is free. Meanwhile, at WSOP satellite tournaments every Sunday since April, the cutting-edge casino and poker site has also been awarding $12K prize packages to weekly tournament winners. While many players that win WSOP prize packages online this year will pocket the cash rather than risk it at the WSOP, the winner of PlayersOnly.com’s very first WSOP satellite tournament remains adamant that he’ll be at the Big One. "Oh, I’m definitely going to Vegas!" said the excited winner in my podcast interview that can be heard here: www.lyceummedia.com/playersonly/PlayersOnly-WSOPSatelliteWinner1.mp3. "I’ve got my plane ticket and my room at the Rio – deal me in!" The final WSOP satellite tournament will be held this Sunday. Players can buy-in for a hundred dollars or win a qualifying free roll tournament held twice a day. Complete tournament details can be found at www.playersonly.com/poker/wsop.php. The $12,000 World Series Prize Packages awarded to tournament winners and the low bid auction winner include airfare, accommodation and enough cash to register in the ultimate poker tournament, the World Series of Poker Main Event, which will be held in Las Vegas July 6 – 17 at the Rio Hotel and Casino in Las Vegas.